Another tool for punishing runners that don't clear their tags. Compared to things like The All-Seeing I and BOOM! it has three fundamental weaknesses though. 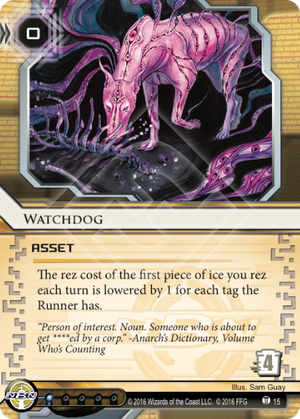 In other to be effective Watchdog needs the runner to stay tagged for multiple turns. To say that's unlikely is a bit of an understatement. Few things in Netrunner are more dangerous than floating tags so runners generally try to get rid of them as soon as possible. The second problem is that in order to get a decent discount you need to land not 1, not 2 but 3 or more tags. Most other cards that trigger on tags only require one or two (BOOM!). It's not impossible, especially with Hard-Hitting News, but unless you're going for Psychographics spending a lot of effort giving the runner more than two tags feels wasteful. And if you can get the runner a whole bunch of tags Best Defense on their ice breakers is likely more effective at keeping them out of your servers. Finally and most importantly if you have the runner tagged rezzing ice more cheaply is one of the weakest options you have available. Consider that to have the runner tagged you need to build a tag heavy deck. But when you go all-in on tags anyway why not put those other cards that hurt the runner a lot more? It's just not a good card.